*10 October 2014, New Delhi*: The New Zealand avocado season was launched today at an event at the New Zealand High Commission hosted with New Zealand Avocado – the peak body representing all New Zealand avocado growers and exporters. New Zealand Hass avocados are available in India from now until the end of February and currently available in organized retail stores like Godrej Natures Basket, Food Hall and INA Market in single packs, twin packs or on kg basis. Avocados can be used at any time of the day and are a great way to add nutrition, flavour and colour to your favourite recipes. Avocados are great at breakfast, lunch, dinner even desserts and snacks. 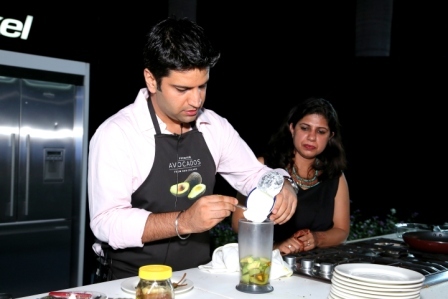 Kunal Kapur, Celebrity Masterchef and avocado lover, showed guests at the event many ways of using avocado to create delicious and nutritious meals. Kapur encourages Indians to enjoy the unique taste and health benefits of New Zealand avocados. New Zealand avocado exporters’ current delivery strategy means that avocados are with handlers in India 5-7 days after harvest, meaning New Zealand growers will deliver avocados of unrivalled freshness. The New Zealand avocado industry’s food safety, traceability and quality assurance programmes set the global benchmark so you can be assured that New Zealand avocados are safe and healthy for Indian families. “I have visited New Zealand. It is a beautiful country that yields premium agricultural and horticultural products that are produced to meet high standards of food safety, quality and reliability,” says Kapur. Kapur says he loves making a New Zealand avocado and kiwi lassi to have with breakfast or lunch as it’s a quick and easy way to get a nutrient boost and it also helps with digestion. Avocados contain over 20 vitamins and minerals and are made up of proteins, good fats and carbohydrates. Kapur says they’re also cholesterol free. Not many people realise how amazing avocados taste when used in baking and desserts. Their creamy texture makes them perfect for ice cream and decadent sweet treats like chocolate avocado mousse. “I love to give my son avocados once a day to keep him healthy and energetic,” says Kapur. Avocado also helps your body absorb more of the nutrients from other foods it is eaten with. In fact, it’s regarded as one of the most nutritionally complete foods in the world. “Adding some avocado to your meals throughout the day is a smart way to ensure you are getting some good nutrition in your diet. New Zealand Hass avocados are also high in vitamin B6, which helps to maintain good energy levels through the day.”Kapur is encouraging Indians to experiment with new culinary combinations this New Zealand Hass avocado season. New Zealand avocados work well with so many different ingredients, they really are amazing anytime. “New Zealand avocados mature on the tree longer giving them a nutty flavour which goes well with salmon and chicken. It can also pair well with light, fresh flavours such as watermelon and the sweetness of strawberry and kiwifruit.” Kapur says. New Zealand avocados are grown in a pristine environment with strong dedication from growers to produce a premium product. Avocados are the third*-*largest fresh fruit export from New Zealand.The total crop for the 2014-15 season is estimated at 7 million trays with 4.5 million expected to be exported. New Zealand Avocado works with the New Zealand industry to set export standards, facilitate market access, promote avocados from New Zealand and provide technical information to all New Zealand growers, of which there are more than 1600, based mainly in the Bay of Plenty and Northland.